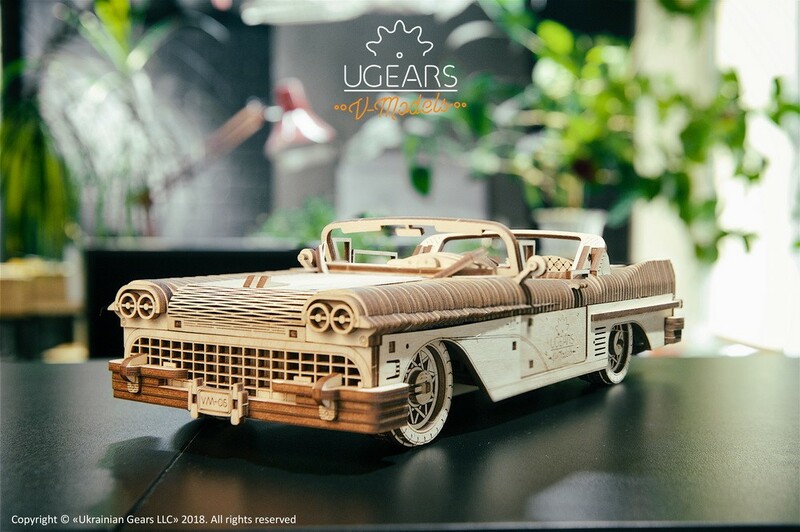 Looking back into the history of mechanics once again, Ugears couldn't miss such an important and interesting period, in a not-so-distant past, as the 50s. Rockabilly music, swing dresses, bobby socks and, of course, magnificent luxury cars and convertibles: feel a part of the time with our new ingenious work – The Dream Cabriolet VM-05. 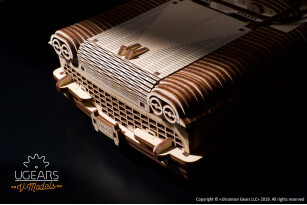 The 50s had given automobiles a completely new look, producing absolutely unique recognizable designs. 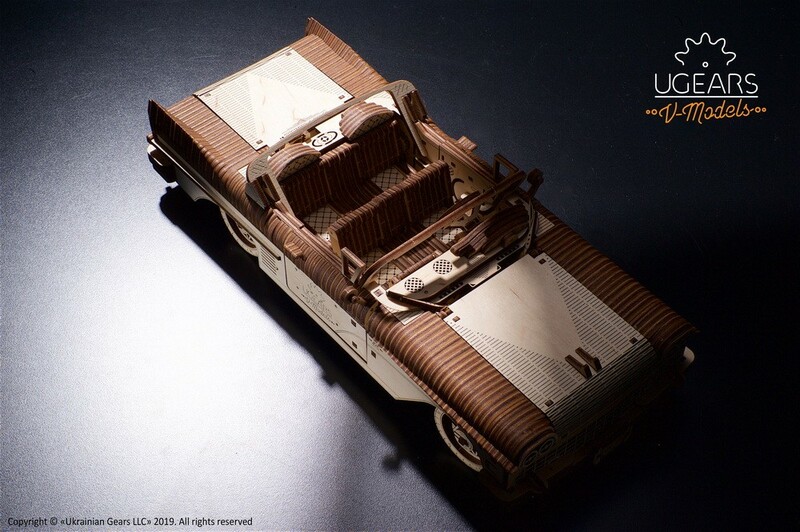 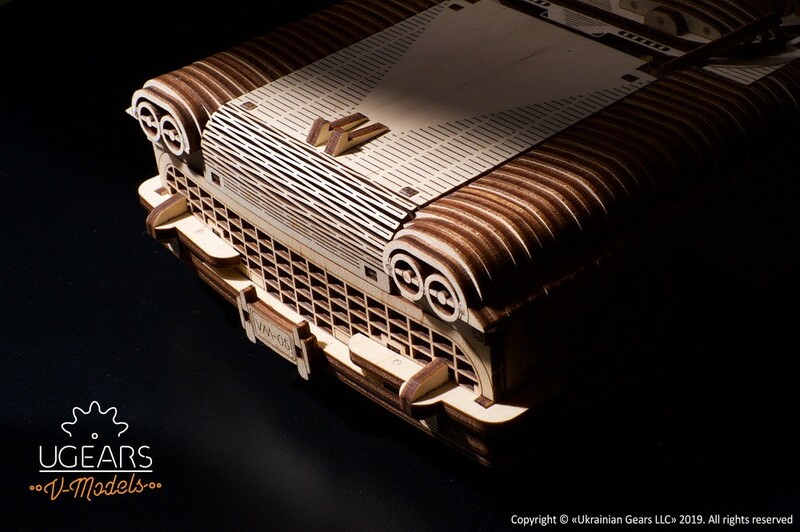 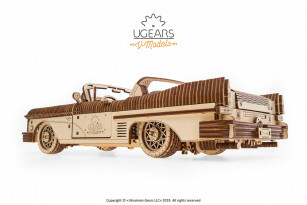 The Dream Cabriolet VM-05 is a highly detailed and extremely realistic tribute of the Ugears’ designers and engineers to the automobile industry highlights of that decade. 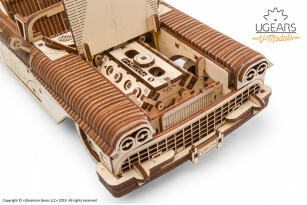 The model is traditionally equipped by a rubber-band motor that powers the mechanism and drives the car. 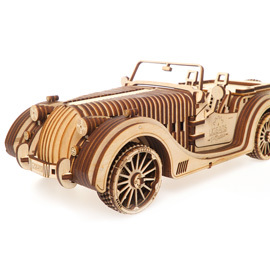 The Cabriolet can go forward or back. To ensure you can take a close look at the beautiful eight-cylinder V configuration engine in operation, we introduced the idle mode. 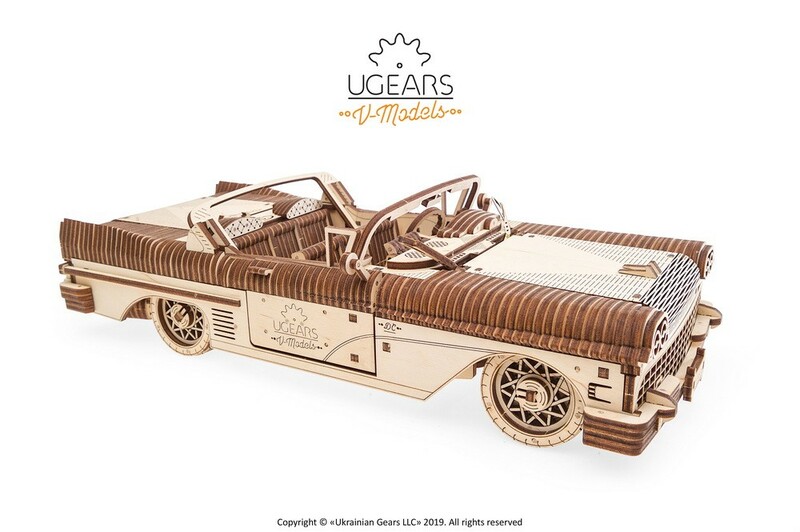 In this mode, your Cabriolet will stay still letting you look under the hood to appreciate the beauty of the moving gears. 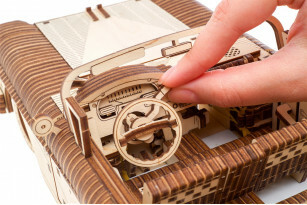 Should you want to put your vehicle in motion, pull the transmission lever on the steering column. 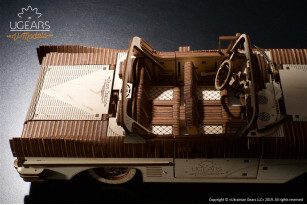 Both front and rear wheels of the model are suspended to make its ride ultimately smooth. 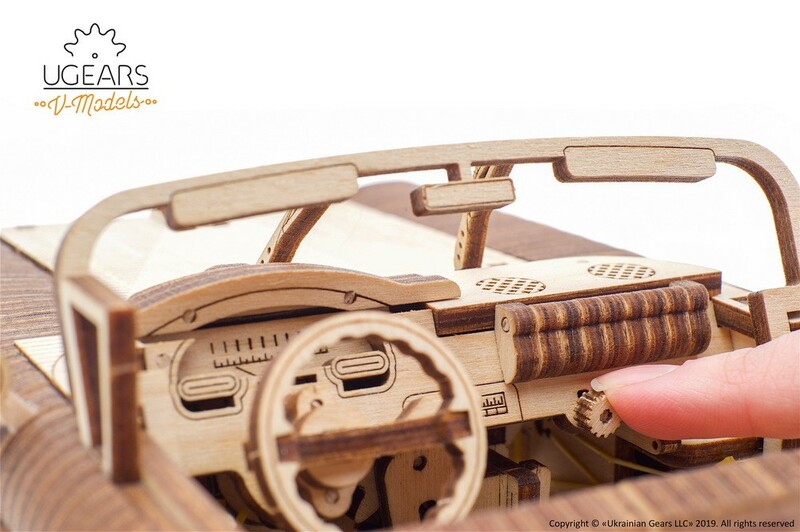 Use the steering wheel to move the front wheel coupling and send the Dream Cabriolet in the direction you choose. 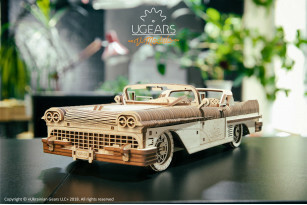 To make the design of this unique model even more realistic, Ugears engineers added a few important elements that make the automobile look extremely lifelike. We believe you will enjoy the window cranks and fully functional windshield wipers as well as a lifting jack and a repair toolkit mounted under the rear trunk. Another mechanical feature is the trunk and hood opening mechanisms that add some extra-vividness to this highly detailed vintage vehicle. 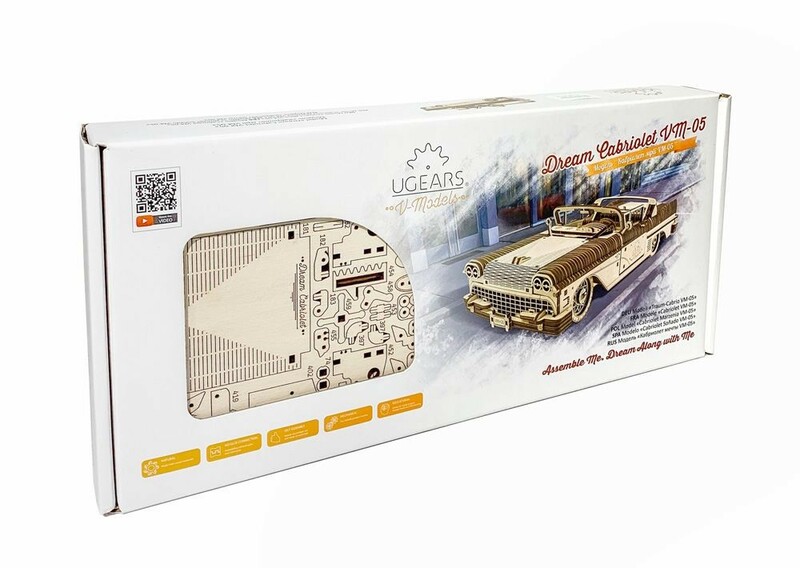 Find your favorite retro radio station and your Dream Cabriolet will take you into the dreamlike 50s to share the best of what the decade has to offer. 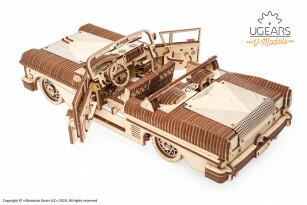 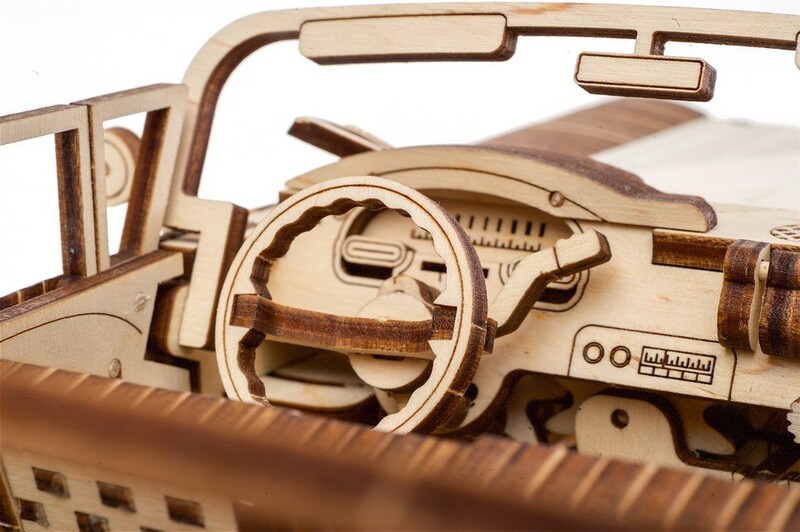 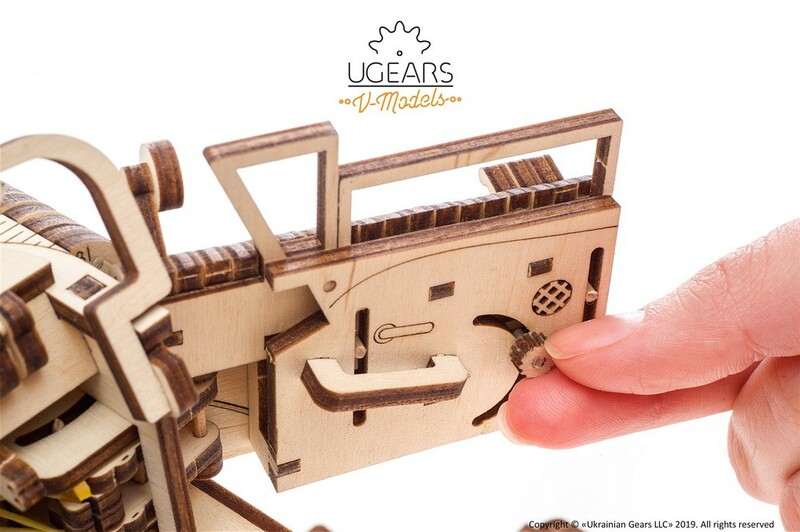 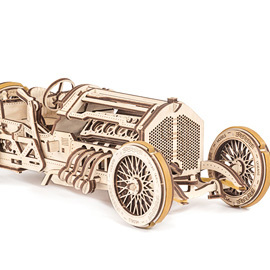 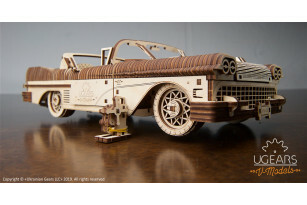 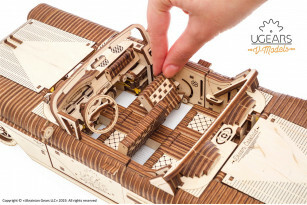 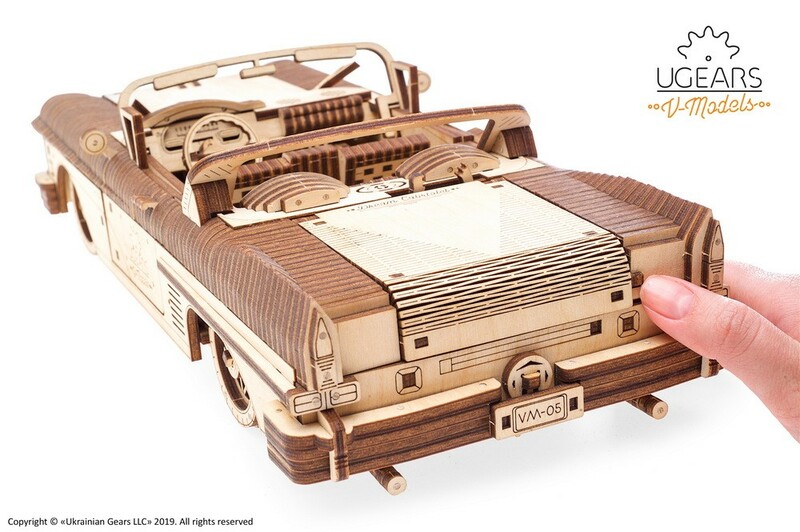 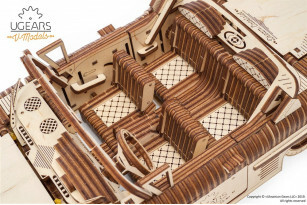 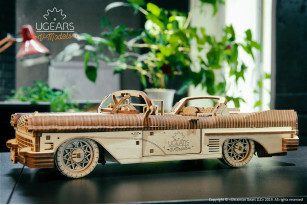 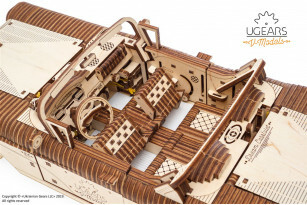 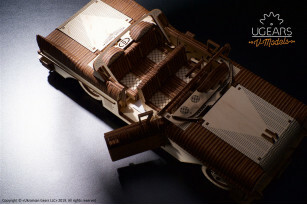 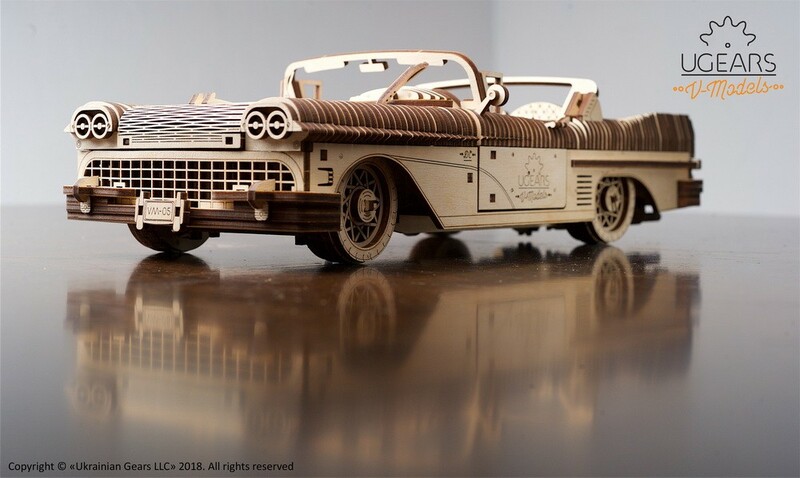 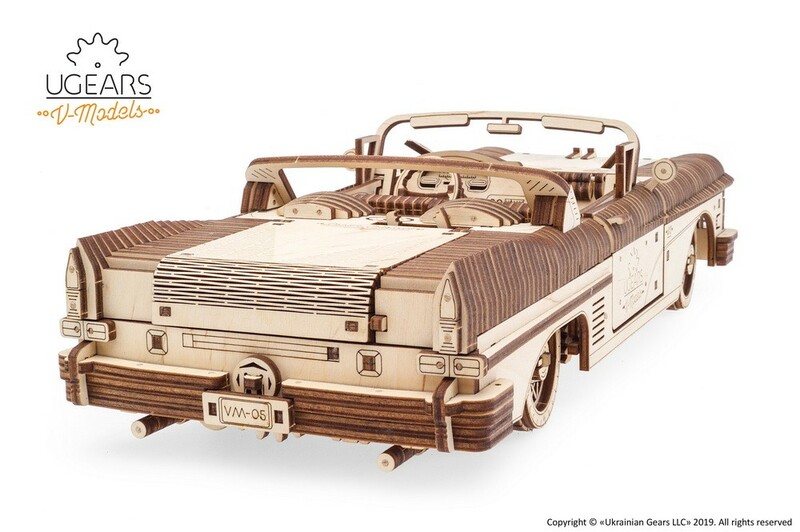 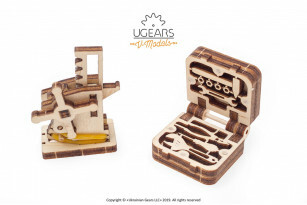 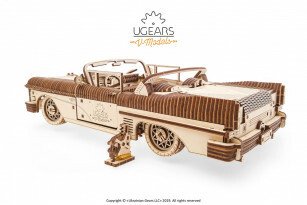 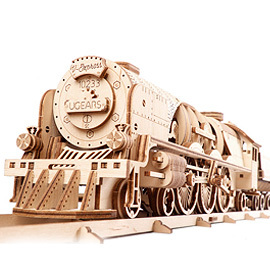 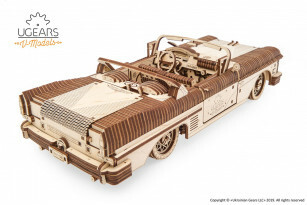 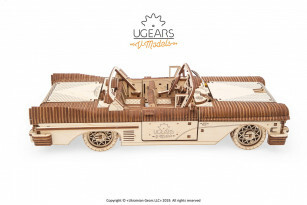 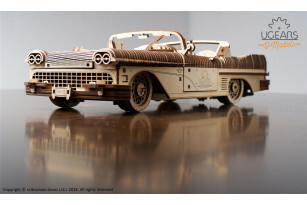 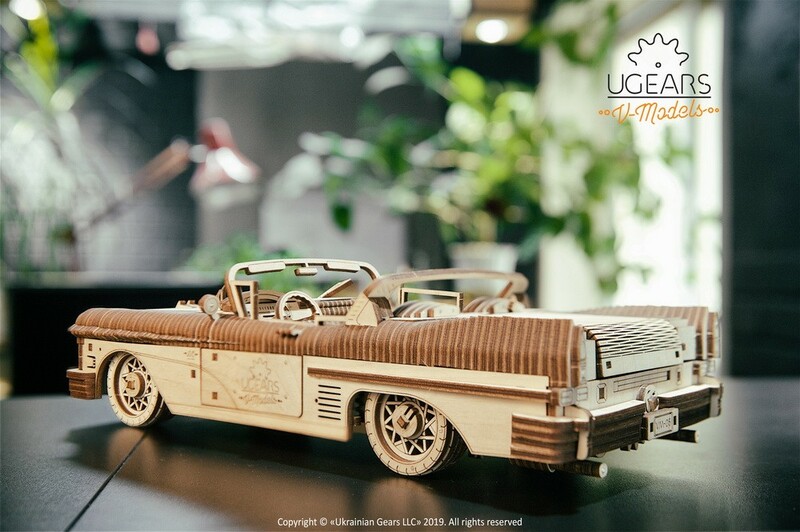 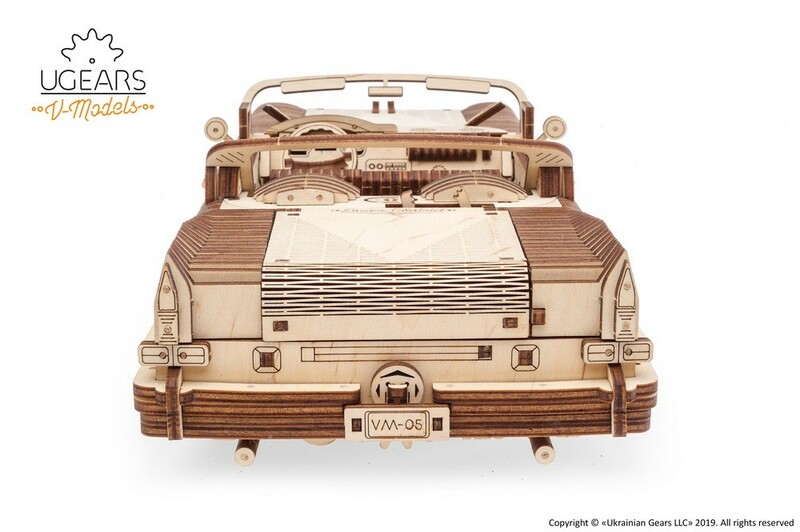 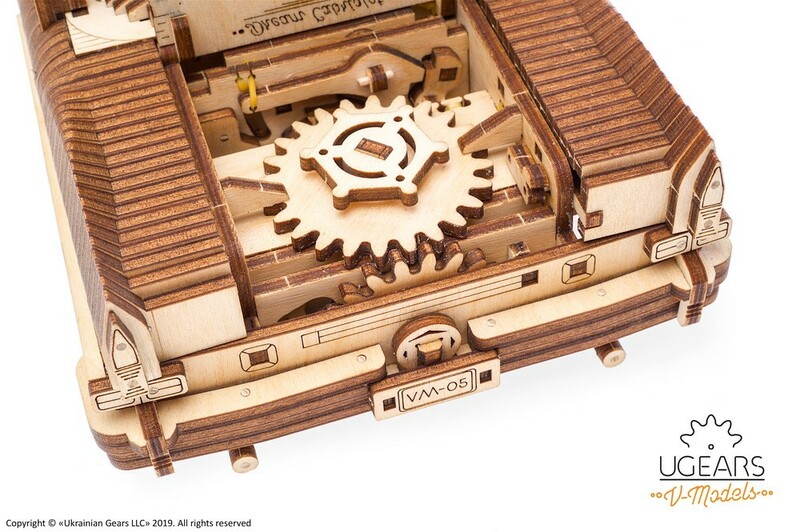 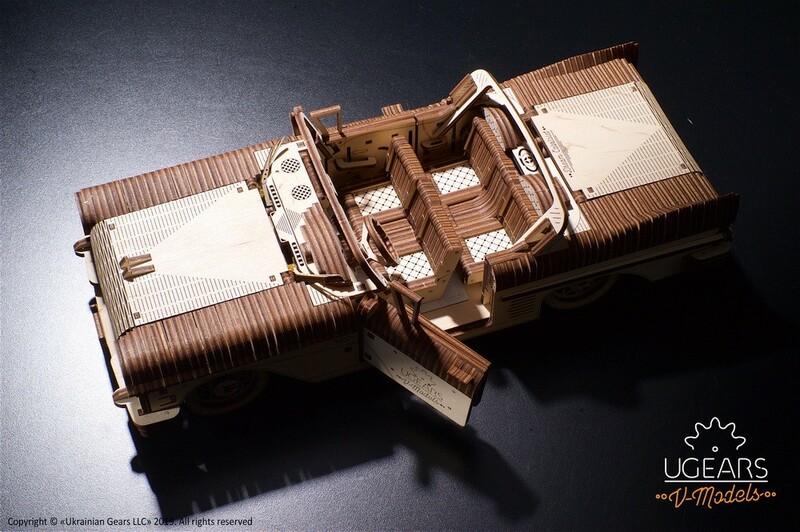 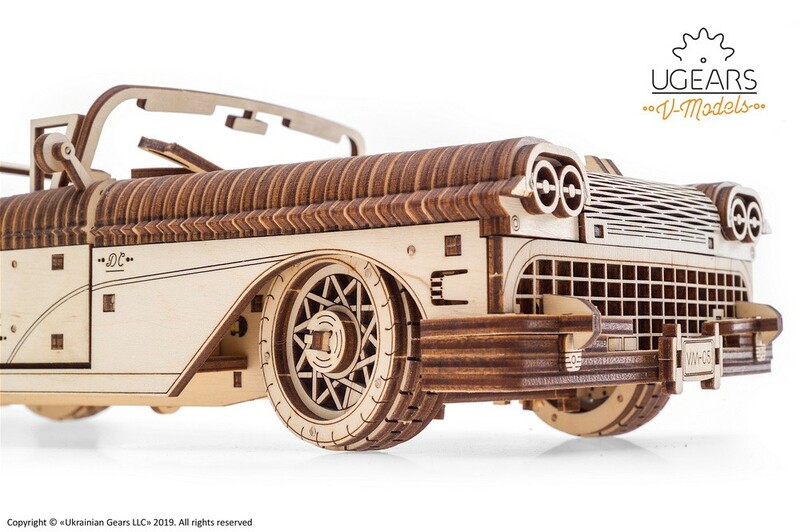 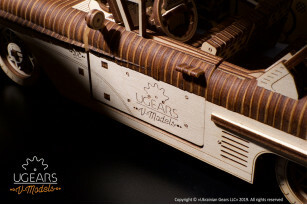 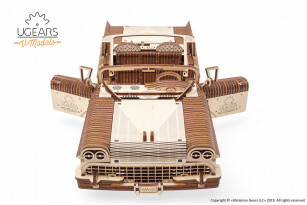 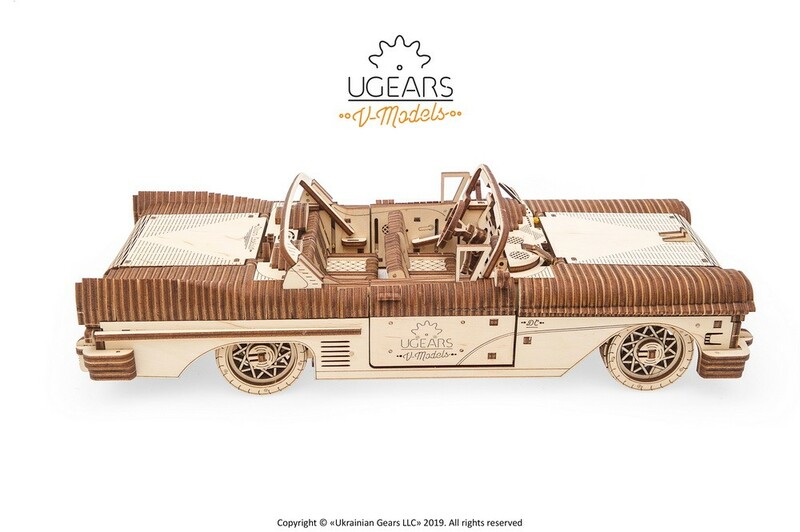 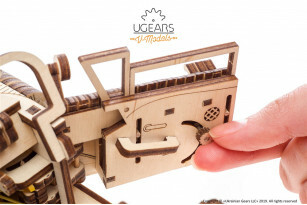 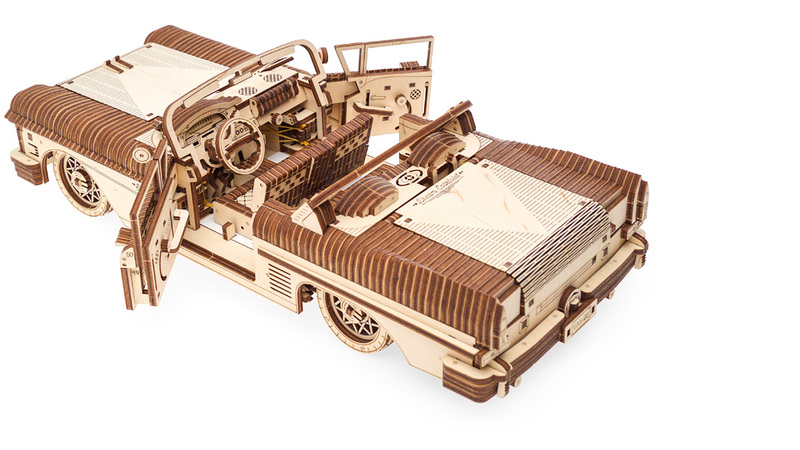 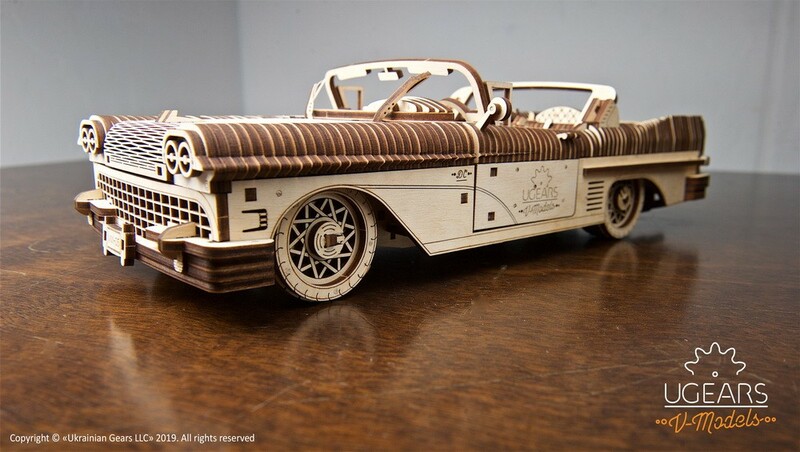 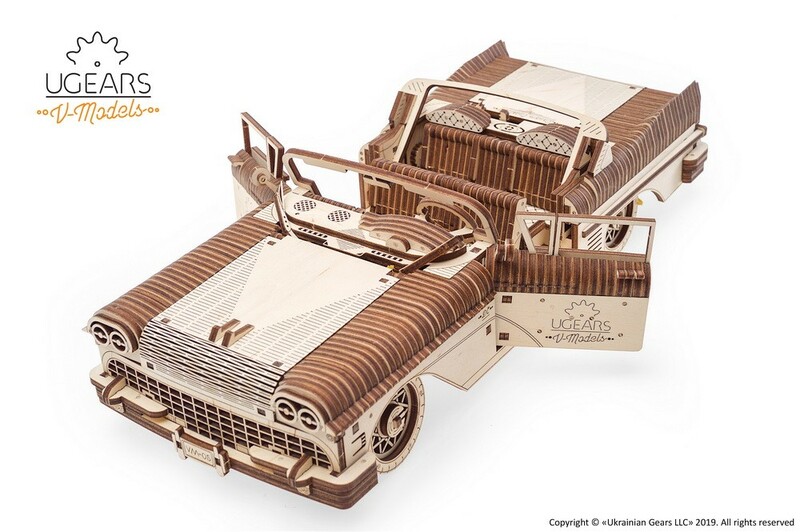 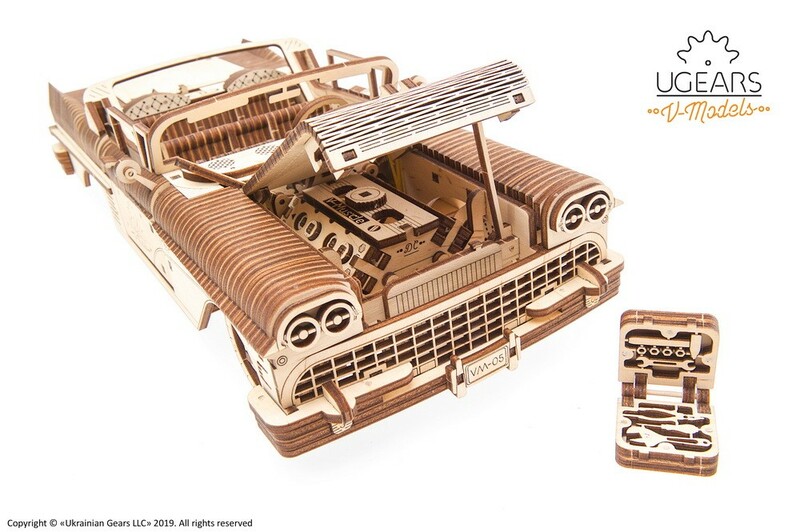 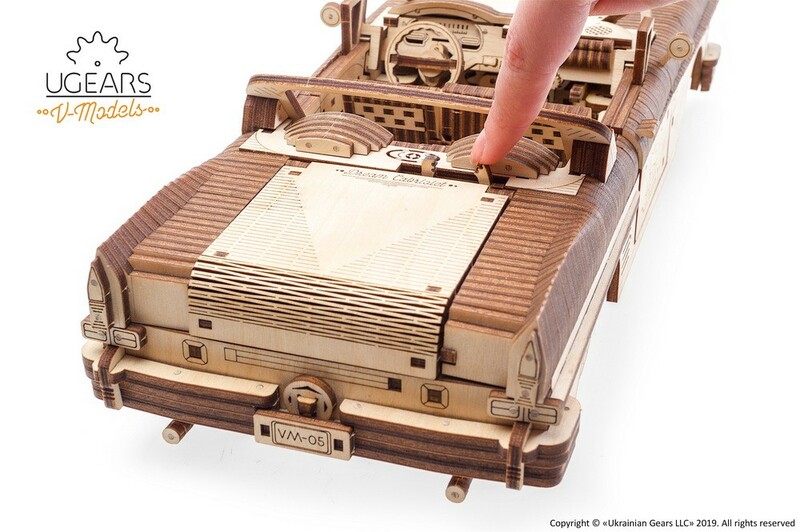 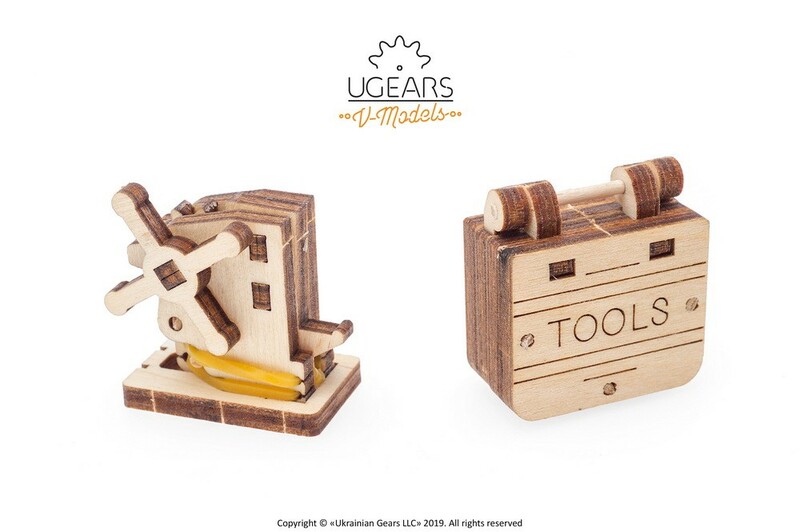 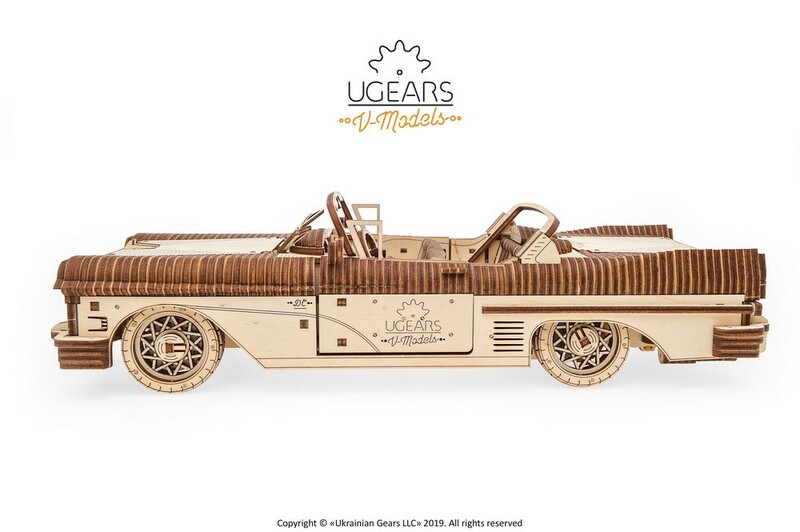 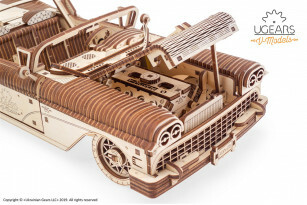 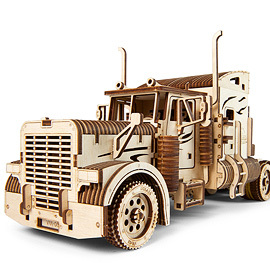 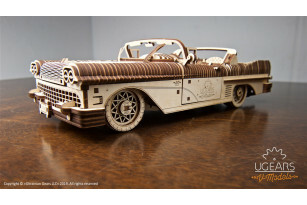 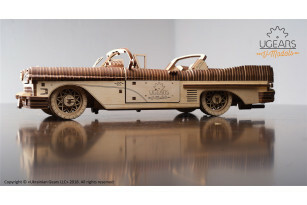 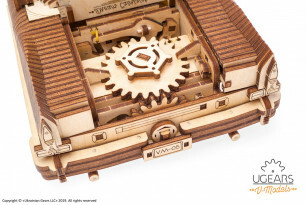 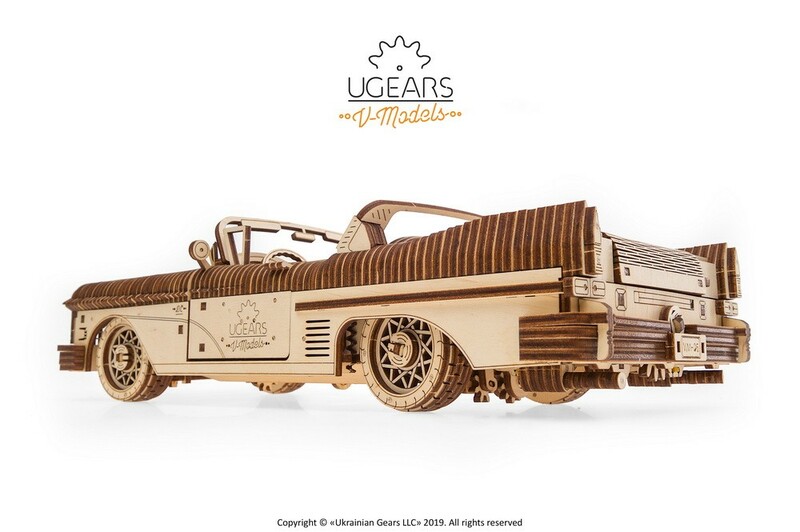 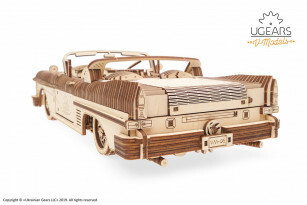 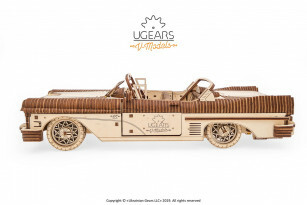 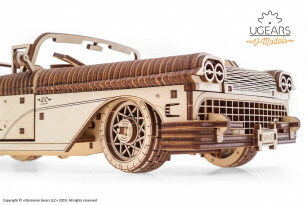 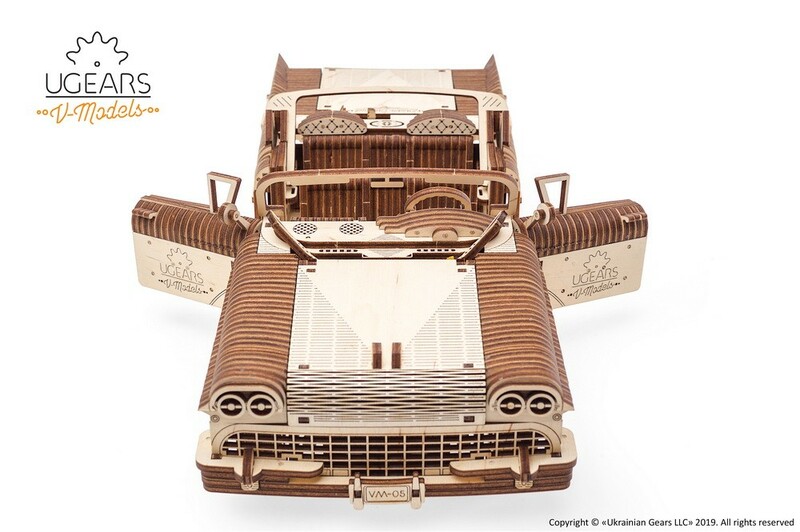 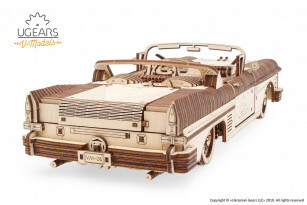 The Ugears Dream Cabriolet VM-05 model kit is made of sustainably sourced high grade wood and has everything you will need for assembly. The quality of the parts is top-notch: a laser method is used for cutting items from a plywood board that provides precise hairline cuts. The details have to be pulled out of the boards and assembled to create a complete convertible. 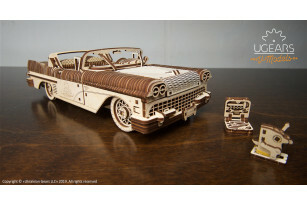 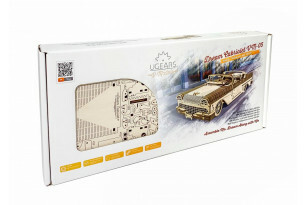 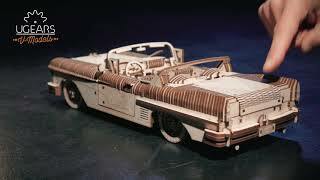 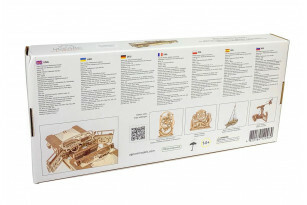 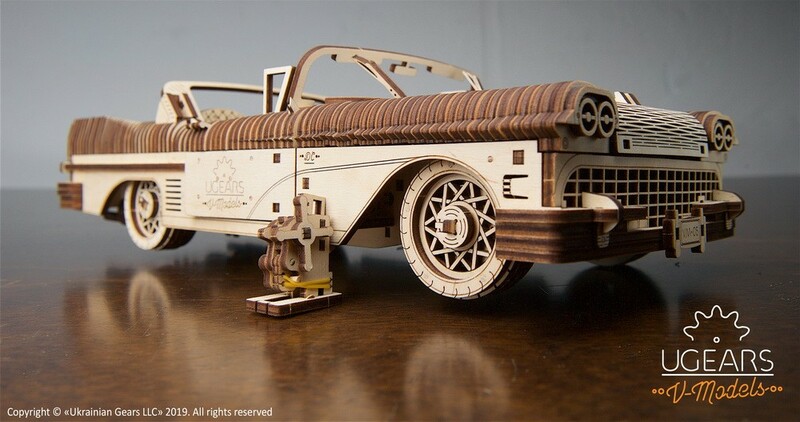 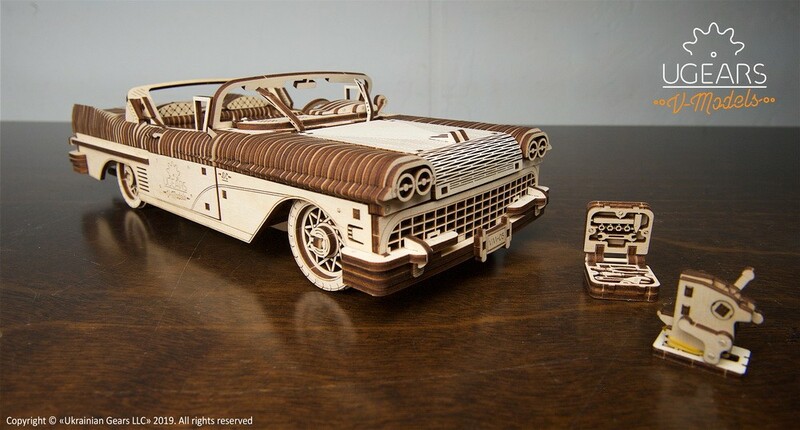 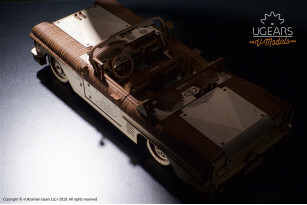 Like all other Ugears models, the Cabriolet comes with step-by-step, full-color, truly easy to follow instructions in 11 languages (English, German, Ukrainian, French, Polish, Spanish, Russian, Japan, Italian, Chinese and Korean) and requires neither glue nor special tools to be fully assembled into functional self-propelled Cabriolet.